As this report attempts to cover an incredible number of athletes who have passed through Montgomery County over the past four or five years, some runners will inevitably be left off the list. The descriptions below are in no particular order, although some athletes are grouped together based on previous and/or current connections. Bernstein earned all-state honors his senior year in cross country, and had continued success for Oberlin. He ran a personal best time 27:57 for 8k at the GLCA Meet in September and followed it up with a 28:32 at the Purple Valley Classic, remaining on his team's top seven for several meets. The original Palmer from Moco had an up-and-down season for Williams College. He started off well with a 10th place finish at the Panther Invitational in 27:56 and a 35th place finish in 27:53 at the Little Three Championships. Although he did not race any of the late season meets, Williams did place 2nd at the NCAA DIII National Championships. Boyd was top ten in the region as a senior in cross country, and D'Alessio was also a strong runner in the county his senior year. They both had up and down seasons for Bucknell University this fall. Neither ran at the NCAA DI Mid-Atlantic Regionals, but D'Alessio dropped a 27:38 at Paul Short and Boyd ran a solid 26:33 the week before in Pittsburgh. The former Wootton standout was much more of a miler than a cross guy in high school, so look for big things from him in track. As a junior and senior, Gay dominated the Moco cross country scene and she still holds the county meet record. She had a very strong sophomore season beginning with a 21:12 6k at the George Mason Invitational, good for 3rd place overall. Later, she dropped that time to 20:37 before blazing a 20:06 at the ACC Championships where she finished 4th. In the postseason, she placed 8th at the Southeast Regionals and 116th at the NCAA DI National Championships, where Virginia finished 2nd and 15th, respectively. These two men comprised one of the most dynamic duos in Moco in recent memory, combining for a number of state titles in their high school years, and they have had continued success in college. At UMBC, Bowie dropped a 26:48 8k in September and kept rolling with 25:52 soon after. He placed 33rd at the America East XC Championship and 102nd at the NCAA DI Mid-Atlantic Regionals, not too far behind the University of Maryland's Kyle Gaffney, the former Blake standout. Tousley also had a quick start to his season, running 21:16 for 4 miles and then a 26:01 8k at Paul Short. In a loaded field at the Princeton Invitational, he placed 70th in 26:25, and later placed 14th at the Centennial Conference Championships. He did not compete at either the NCAA Mideast Regionals or at the NCAA DIII National Championships, where Haverford placed 8th as a team. These two were part of the stellar squad B-CC squad that won the 2007 Maryland 3A State title by a single point. Prevost did not compete this fall for East Carolina University. 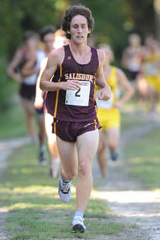 Straughan opened up with a 19:56 6k effort in his second cross country season for Dickinson College, and later burned a 26:05 8k at Paul Short. He finished up with a 45th place 26:27 at the NCAA DIII Mideast Regionals, but unfortunately had a poor race at the National Championships. Short only raced twice in his sophomore season for Washington University in St. Louis, but did manage a solid 26:57 8k. This duo chose to attend the same college after working extremely well in high school together. The pair started off the season strong for Vanderbilt University, with Hannallah running 18:47 and McManus running 19:38 in their first 5k of the year. They dropped to 18:16 and 19:09 the next week at the Greater Louisville Cross Country Classic, and Hannallah battled to a 22:30 6k at Pre-Nationals in Indiana and 22:27 at the SEC Championships where she placed 27th. She followed that up with a stellar performance at the NCAA DI South Regionals, rolling a 21:21 for 29th place, earning her All-Region honors and helping her team to a 5th place finish. Decker worked very hard to make himself the runner he was in high school, and his efforts have remained strong through his four years of college. The Emory senior opened up his season with a 27:36 8k, but he really started going when he ran an 8k in 26:06 which was worth 10th place at the JSU Foothills Invitational. He netted an 8th place finish at the NCAA DIII South/Southeast Regionals in 27:24, and followed it up with a 187th place finish at Nationals in 27:25. The 2008 Footlocker National Champion has high school cross country credentials unmatched by any athlete ever to come through Moco. He owns numerous course records and various cross country titles, as well as the #2 spot on the Mocorunning Track All-Decade Team. 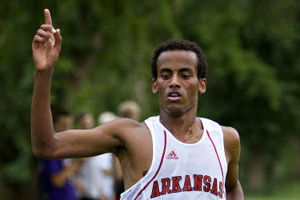 This fall he competed as a freshman for the University of Arkansas, opening with a victory at the school's home invitational in 19:43 for the 4-mile course. His first 8k of the season was an 8th place 24:01 at the Missouri Southern Stampede followed by a 24:25 at the Wisconsin Invitational, good for 17th place. At the SEC Championships he earned second team All-Conference and All-Freshman Team honors with a 9th place 25:01. He ran alongside teammate Dorian Ulrey at the NCAA DI South Central Regionals and finished 2nd in 30:25 for 10k, and at the National Championships he posted a 48th place 30:27, just missing All-American honors by a few places. While Chapin may have been one of the better track athletes to come through Moco in recent years (or ever), he was certainly a small fish in a big pond at Stanford this season. In the one race he did run, the Stanford Invitational, he ran very well, clocking a 25:56 in his first ever 8k. However, he did not race again for the Cardinal, who were ranked #1 in the nation for most of the season; they finished a disappointing 10th at nationals. 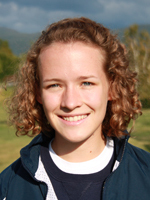 McCall was a three-time WCAC Champion while in high school, and has run very well for Colby College over the past few years as well. She started her season with a 20:28 5k at the Class Relay Meet and quickly dropped to 19:47 at the UMass-Dartmouth Invitational. She followed these with a series of strong races: she ran 24:20 for 6k at the Purple Valley Classic, 20:35 for 5k at the Open New England Championships, and 20:19 for 19th at the Main State Championships. Her season ended with a 25:21 6k at the ECAC Championships. Another recently inducted member of the Mocorunning All-Decade Cross Country Team, Forcino became a very strong runner by her senior year of high school. She is now running for American University, and her fall campaign was just as strong as any she had in high school. Her season began at the Mount St. Mary's Duals with a 14th place 19:28 5k and then 6k's of 24:38 at the Navy Invitational and 23:11 at the George Mason Invitational. A 20:02 5k earned her 24th at the Blue & Gold Invitational, and she finished her season with a 24:22 6k at the Patriot League Championships and a 23:49 for 87th at the NCAA DI Mid-Atlantic Regionals. Perlis was a great athlete in high school, running some excellent times for the school that the Obama children currently attend, Sidwell Friends. The Williams senior opened his season with a nice 26:23 8k at the Williams Purple Valley Classic, and only improved from there. He ran a nearly identical time to finish 6th place at the Little Three Championships and finished 10th at the NESCAC Championships in 26:43. He followed up that with a 25:42 12th place effort at the NCAA DIII Northeast Regionals, but he injured his ankle at the national meet and did not finish; however, the Ephs still placed 2nd in the nation. Mat is the younger of the two Abernethy brothers, both distance stars in high school, and he competed in his sophomore season for the University of Notre Dame this fall. Like former Georgetown Prep teammate Chapin, he only ran one race this season, but he made it count-he flew to a 25:35 at the Notre Dame Invitational, which earned him 28th place. In his senior year, Speiden was one of the stronger cross country runners around and led the Sherwood team for most of the year. This fall, he began the season for Elizabethtown College with a 28:01 8k at the Navy Invitational and then a 4k in 12:58 for 22nd at Dickinson Long-Short Invite. At Paul Short, he ran 27:05 for 8k and followed that effort with a 26:38 at Oberlin's Inter Regional Rumble. A 28:10 earned him 11th place at the Middle Atlantic Conference Championship, where his team captured their 10th MAC title. The NCAA DIII Mideast Regionals and subsequent National Championships also gave Speiden a chance to show his stuff: he ran 26:51 for 72nd place at regionals and 27:38 for 198th place at nationals. The Quince Orchard top seven that won the 2007 Maryland State title all graduated together, and some of them are still running at various schools along the East Coast. In his sophomore season for La Salle University, Laratta was off to a hot start with a 15:32 3-mile effort, and followed it up with 26:07 8k shortly thereafter. He dropped to 25:39 at Paul Short, and then ran a 26:49 at Penn State a week later. Nearby at Indiana University of Pennsylvania, Joson ran 27:13 early on for 8k and finished as the number one runner for his team in their home invitational. At Paul Short, he was IUP's number two in 26:21, and after a couple rough 8k's in towards the end of the season, he came on strong with a 41st place finish in 33:34 for 10k at the NCAA DII Atlantic Regionals. Heading West to Oberlin, Migdall posted a season best time of 28:43 for 8k at the GLCA Meet and only ran one other race in the fall. Down South, former county champion Darmody lead his team the whole season, starting with a 26:05 8k at the Roy Griak Invitational in September. He quickly rolled to a 25:15 at the Blue Ridge Open, beating fellow Moco stars such as Zahorodny, Moen, and Graves by over a minute. At the Big South Championships he finished 7th in 26:15 and then placed 63rd at the NCAA DI Southeast Regionals in 32:15 for 10k. 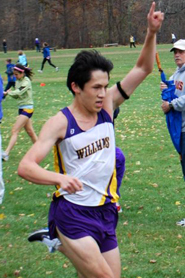 Rainard was a leader on the Good Counsel team his senior year, and one of the better runners in the WCAC as well. Just as in high school, he paced his team, SUNY Maritime College, in several races this fall. In the early season races he placed very well, claiming 8th at the Baruch Invitational to help his to victory, 17th at the Bard Invitational, and 11th at the Mount St. Mary's Invitational. He ran a 28:59 8k at the NJIT Highlander Invitational and then placed 7th at the Hunter Invitational before finishing 4th at the St. Joseph's Invitational and 5th at the Skyline Conference Championships. At the NCAA DIII Atlantic Regionals, he ran a season-best time of 28:50. Now a sophomore for Ohio-Wesleyan University, Kronemer was always a solid performer in cross country, earning all-state honors as a senior. He opened this season with a smooth 9th place 16:36 5k at a tri-meet and a 7th place 26:37 8k at the GLCA meet. He improved to 26:11 at the Calvin Invitational, and later ran 27:05 for 17th at the Gettysburg Invitational. With a 12th place finish in 27:03 at the NCAC Championships, he earned second-team all-conference honors; he bettered that performance with a 32nd place 26:47 at the NCAA DIII Great Lakes Regionals, earning all-region honors and helping his team to a 6th place finish, their best in nearly thirty years. The captain of the 2007 Blair team was a county champion on the track and has carried on her success to Tulane University. This fall, she debuted with a time of 20:02 at the Memphis Twilight 5k, placing 48th. She later placed 14th in the LSU Tiger Festival in 23:27 for 6k and turned in a season-best time of 18:45 for 5k at the Auburn Invitational. A 20:45 5k at the CUSA Championship was good for 67th place, and she added a 23:30 6k at the Chili Pepper Invitational as well. She closed out her season with a 92nd place finish at the NCAA DI South Central Regional Championship in 24:03 for 6k. As a freshman in high school, King was a soccer guy, but was one of many who do track and subsequently fall in love with running and end up doing cross country. He emerged his senior year as one of the top runners in the county. His first season for Pepperdine University began with a 16:51 5k at the Malibu Oceanside Open and a 28:47 8k at the Asics/UC Irvine Invitational. At the UC Riverside Invitational he ran 27:27 before dropping to 27:10 at the Roadrunner Invitational and then 27:00 at the Bronco Invitational. A 27:15 earned him 47th place at the West Coast Conference Championships and he closed out his season at the NCAA DI West Regionals with a 34:43 10k. Nick Simpson and Ben Withbroe appear to be the future of Einstein cross country, but before they arrived, there was another strong pair of runners from the school. Alex Bodaken now at the University of Wisconsin, no longer runs competitively, but Devlin-Foltz started his sophomore at Occidental College with a 22:00 6k at the Redlands Invitational and then a 27:39 8k at Sundoger Invitational. At the West Region Preview meet he ran 28:22 for 8k, and then followed it up with a 29:45 at the SCIAC Multi-Dual Meet. He finished the season strongly with a 30th place 27:34 at SCIAC Championships and 28:37 at the NCAA DIII West Regionals, which was good for 72nd place. Orndoff was one Rockville's best runner for quite some time and is now running at Lynchburg College alongside a certain national champion. The sophomore began his season with a 28:54 8k at the Virginia Wesleyan College Invitational and then a 28:26 at the Elon Invitational. At the Dickinson Long-Short Invite he posted a 28:37 and followed that with a 29:06 6th place effort in the rain at the Maroon Invitational. He did not run at the Paul Short Invitational but still managed a quick 27:36 for 18th place at the Blue Ridge Open and then a 29:06 for 17th place at the ODAC Championships, helping his team to its third Conference title. He ran 29:00 at the NCAA DIII South/Southeast Regionals to place 46th and finished his season at the National Championships where he ran 28:45. Ever since his freshman year in high school Flynn was an exceptional athlete: he placed in the top nine at counties and top six at states three years in a row, including a Maryland State title as a junior. 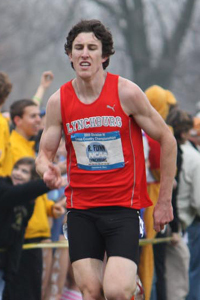 His success only continued at Lynchburg College, and he was the National runner-up in the 10k on the track this spring. He was incredibly dominant this fall: he won the Paul Short Invitational Brown Race in a season-best and school record 24:43 for 8k and then ran 24:53 at the Blue Ridge Open for 3rd place, although he was the top collegiate finisher (the two runners ahead of him were pro or semi-pro runners). At the ODAC Championships, Flynn claimed his 3rd Conference title in 26:45, winning by 44 seconds; he followed this up with a win at the NCAA DIII South/Southeast Regionals in 26:10, marking the fourth time he has earned all-region honors. Perhaps he saved his best performance for last, as he won the NCAA DIII National Championship in 25:09 for 8k, winning by twenty-three seconds (the second greatest margin of victory ever at the meet) and setting a new course record. He ran much of the race with Hamilton's Peter Kosgei, the 2008 National Champion, but pulled away in the last mile as Kosgei faded to 43rd place. Now a five-time All-American, he was named NCAA South/Southeast Region and National Athlete of the Year as a result of his outstanding final season. Janes is rightfully a legend in Moco; he was a soccer guy as a freshman, but like others was enlightened to the joys of cross country and proceeded to place in the top eight at counties three times, including a victory during his dominant senior year. He was also one of the better runners in the state for a long time, finishing with all-state honors three times and finishing 3rd as a senior. After a couple of rough years in college, he bounced back strongly for York College this year. His season began with a 17:50 5k at the Green Terror Invite and then a 6th place 28:28 8k at his school's home invitational. At the Goucher XC Classic he posted an 11th place 28:51 and followed that up with a 4th place 28:21 at the Hood College Invitational, which earned him his school's Athlete of the Week award. The CAC Championships gave him another chance to shine, as his 27:31 7th place finish garnered him all-conference honors. He concluded his season with a 91st place finish in 27:15 at the NCAA DIII Mideast Regionals. Epstein became one of the better distance runners in the county and earned all-state honors as a senior in cross country, and he is now running for Bowdoin College. He began this fall with a 27:08 8k at the Connecticut College Invitational and then grabbed 3rd place in 28:39 at the Colby College Invitational. At the Maine State Championships he placed 22nd in 28:02; a 27:47 the next week earned him 36th at the NESCAC Championships. His team's season ended at the NCAA DIII New England Regionals where he ran 27:11 for 86th place. Only in his senior cross country season did Teich establish himself as solid county runner, placing in the top ten at the postseason meets and helping his team to their first Maryland State title. He had continued success for Vassar College this fall, opening up with a trio of top four finishes at the first few meets: he ran 20:48 for 6k at his school's home invitational before dropping to 19:45 at the Hamilton Invitational and rolling a 26:56 8k soon after. At the Liberty League Championships he ran 27:40 in muddy conditions but bounced back with a 26:33 at the University of Albany Invitational. His season concluded with several races in the mid-27 minute range at the Saratoga Invitational, a 26th place finish at the ECAC Championships, and an 88th place finish at the NCAA DIII Atlantic Regionals. Abernathy was a great team athlete in high school, first helping Good Counsel to two WCAC titles and then Georgetown Prep to two IAC titles. He is still running strong as a junior for the University of Maryland, beginning this past season with a 27:41 8k at the UMES Lidlifter Invite and rolling to a 16:06 5k at Wolfpack Invite soon after. At the Panorama Farms Invite he clocked a 26:20 8k and took 73rd in 25:41 at the ACC Championships. His season concluded at the NCAA DI Mid-Atlantic Regionals, where he ran 36:13 for 10k. In high school, Gaffney was a star from the earliest stages, running 9:45 for 3200m in track as a freshman. He excelled over the next several years, and he has continued to have success at the University of Maryland. This fall, he opened with a 26:11 8k at the UMES Lid-Lifter and a 15:19 5k at the Wolfpack Invite in North Carolina. Gaffney then sizzled 8k's of 24:11 at Great American, 25:43 at the Panorama Farms Invite, and 25:00 at the ACC Championships. He finished his season on an off-day at the NCAA DI Mid-Atlantic Regionals, running the 10k in 34:16. Sherwood's distance guru before Solomon Haile was Barnard, who could be seen at the front of nearly every cross country race he ran his junior and senior years of high school. In his third season for Salisbury, he earned Capital Athletic Conference Athlete of the Week twice, the first time for leading his team at the Don Cathcart Invitational with a PR of 26:02 for 8k. After a 26:22 at Paul Short, he ran 26:58 for 11th place at the competitive Gettysburg Invitational. At the CAC Championships, Barnard placed 4th in 27:17, topping the 7th place finish of York College runner and former Gaithersburg star Ryan Janes, who had beaten out Barnard for the 2005 county title by one second. Barnard completed his season with 66th place finish in 26:44 at the NCAA DIII Mideast Regionals. In high school, Wil Z was the guy who had the widest range in running events: he could burn most sprinters in a 200m, but also was top four at the county and state meets his senior year. His best events landed somewhere, and he established himself as one of, if not the best, middle distance runner the county has ever had. He led his team in every single race this season, starting with a 12:30 4k at the Campbell CC Carnival, a 3rd place 15:17 5k at the Seahawk Invitational, and a 21:20 4-mile at the Mountaineer Open. What followed were a slew of fast 8k's in 26:08, 26:20, and 26:04 at the Mason Invitational, Blue Ridge Open, and CAA Championships. At the NCAA DI Southeast Regionals he placed 82nd in 32:39 for 10k. This tandem put on some spectacular performances during their years at WJ; many of Moen's best races landed him county and state titles. The two continued to have success for Appalachian State University, running a four-mile race early in the season in 21:06 and 21:15, respectively. They also set blistering PR's of 25:22 and 25:26 at the Paul Short Invitational. Graves finished as high as 4th on the team and Moen was also on the Varsity squad for the better part of the season. He helped his team win their 5th straight SOCON Championship with a 26:17 23rd place finish, earning him all-freshman honors as well. 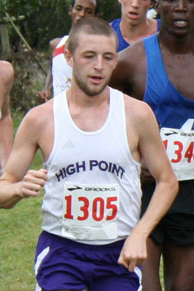 At the NCAA DI Southeast Regionals, he ran 33:44 for 10k on the team that finished 11th in the region. Morrison is now a sophomore at Duke and while she is running well in cross country now, she never ran it in high school. As a middle distance expert she stuck to the track where she won plenty of county, region, and state titles. She began this fall season nicely and by early October she had already dropped an 18:45 5k, good for 9th place at the Hagan Stone XC Classic. A 19:05 earned her 33rd at the Blue Ridge Open Meet, and she ended a successful season with a 6th place 18:50 at the Reebok Pack Invitational. Palmer was a middle distance monster in high school, and he also placed very highly at the county and state meets during the two seasons of cross country he ran. 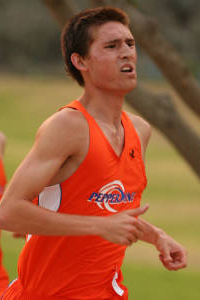 This fall, he threw down a 16:42 5k early in the season and then a 27:50 8k soon after. He did not race any of the championship meets for East Carolina University, but expect some fast track performances come springtime. Nice article. One additional runner worth mentioning: Michele Levy (Wootton, 3rd place finisher in MD 4A States in 2002) competed for the University of Tennessee. In the NCAA South Regionals, she ran a 21:59.72 (6K), finishing in 54th place. She was also named to the SEC Academic Honor Roll. If you're gonna mention an Einstein athlete, you've gotta look at Dawit Zewdie and his 25:4something for MIT along with a bunch of low 26 efforts. But thanks for doing this, overall a great article.